Which horse has the best pedigree to handle twelve furlongs in the final leg of the Triple Crown on Saturday, June 9 at Belmont Park? My Belmont Stakes list concludes with late entrant My Adonis. My Adonis’s sire Pleasantly Perfect (by Pleasant Colony) won 9 of 18 races from 2001-04 including the G1 Breeders’ Cup Classic in ‘03. The Lane’s End Farm stallion is responsible for Breeders’ Cup Filly & Mare Turf winner Shared Account, multiple graded turf route winner Cozi Rosie, 2-time ‘Big Cap runner-up Setsuko, and recent G3 Affirmed hero Nonios. Pleasantly Perfect’s sire Pleasant Colony (by His Majesty) won 6 of 14 starts including the G1 Kentucky Derby and G1 Preakness. His Triple Crown bid came to a halt with a 3rd place finish in the 1981 Belmont Stakes. The late sire is responsible for such prominent runners as Pleasant Tap, Pleasant Stage, St. Jovite, Behrens, and ’93 Belmont Stakes hero Colonial Affair. Gemologist and Alpha punched their Kentucky Derby 2012 tickets after running 1-2 in an exciting edition of the Wood Memorial at Aqueduct on Saturday. The Lumber Guy was the headstrong early leader through splits of :23.04, :47.57, and 1:22.54. My Adonis tracked in 2nd, followed by Gemologist on the outside and Alpha along the rail. The Lumber Guy was getting pressure from My Adonis and Gemologist with three furlongs to go. Gemologist put away his two pace foes but had to deal with a fresh challenge from Alpha. The stage was set for a thrilling finish and Gemologist stuck his neck out on the line with Alpha three clear of rallying show finisher Teeth of the Dog. Tiger Walk finished 4th and was followed by The Lumber Guy, Street Life, My Adonis, and Casual Trick (more breathing problems). Gemologist stopped the clock in 1:50.96 and paid $4.40 to win under Javier Castellano. Todd Pletcher’s undefeated colt will return to Palm Meadows Training Center in Florida to prepare for the Kentucky Derby. Gemologist fans should be pleased. He showed he could stalk and pounce and turned back talented colt Alpha in a determined effort. He is 2-for-2 at Churchill Downs and could end up the Derby favorite, depending on what happens with Hansen in the G1 Blue Grass at Keeneland on April 14. Alpha did everything but win under Ramon Dominguez. He was on good gate behavior once again and proved he could take dirt in the face after racing along the rail. The McLaughlin/Godolphin colt finished up nicely and his numbers are on the rise. This was a solid Derby prep from start to finish. 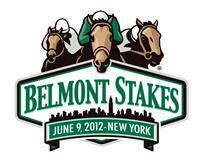 Wood Memorial 2012 Preview – Will Gemologist remain unbeaten? Saturday’s Grade 1 Wood Memorial at Aqueduct is worth a cool $1 million and provides New York sophomores a final chance to qualify for Kentucky Derby 2012 on graded earnings. #6 Gemologist (8-5) is 4-for-4 and needs a top two finish to make the starting gate on the first Saturday in May. The sharp early-pressing type exits a romping tally over G3 Illinois Derby favorite Currency Swap in his Gulfstream return and tries to avoid a bounce while returning in three weeks. #3 MY ADONIS (8-1) might be a cut below but he looks like the value play in this spot. The Kelly Breen trainee should sit a decent tactical journey and his numbers are on the rise. He gets away from Hansen after finishing behind the juvenile champ in the G3 Holy Bull and G3 Gotham. #1 Alpha (5-2) enters fresh and projects a ground saving tactical trip for the productive Dominguez/McLaughlin team. He was my original top ranked Derby contender when I began my list last September and I like the progress he is making this season. #7 Tiger Walk (15-1) deserves a longshot look. 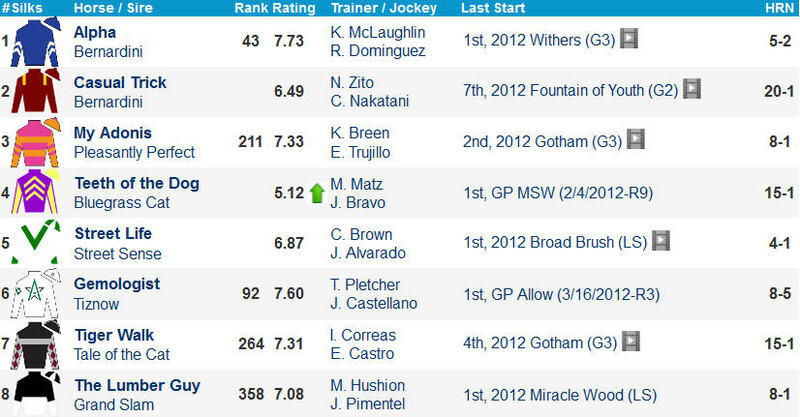 He finished a solid 3rd in the G3 Withers and was hung out to dry from post 13 in G3 Gotham (missed 3rd by head). His stablemate Millionreasonswhy is a strong contender in the G3 Comely earlier on the Big A program. #5 Street Life (4-1) showed a nice late kick on the inner dirt in his last pair despite not getting much pace help. The son of Street Sense is on the upswing and will be finishing. #8 The Lumber Guy (8-1) easily captured a pair of sprints to begin his career and looms a pace player at the very least. He will probably find this company and distance a bit beyond his scope at this stage. #2 Casual Trick (20-1) is trying to rediscover his GP Derby form for Zito. He reportedly flipped his palate in his last pair and had surgery to correct the breathing problem. #4 Teeth of the Dog (15-1) is getting better for Matz but this is a tough spot for a horse exiting a head maiden victory. Juvenile champ Hansen is back in the swing of things on the road to Kentucky Derby 2012 after taking a bite out of the Big Apple in Saturday’s Grade 3 Gotham Stakes at Aqueduct. Hansen did everything right in the Gotham Stakes and Ramon Dominguez gave him a great ride. He relaxed beautifully from an outer post and was much the best over My Adonis, who was well clear of rallying show finisher Finnegans Wake. 4th place finisher Tiger Walk broke from post 13 and just missed rounding out the trifecta. I have never been a huge Hansen fan in regards to ten furlong success on the first Saturday in May but he did was he was supposed to do at the Big A on March 3. He removed the hood, tracked the pace, and easily toppled a modest group. That has been a recurring theme on the Derby trail so far. Alpha, El Padrino, Hansen, and Union Rags have all captured graded races against suspect company. El Padrino has been running the fastest races and Union Rags wins the visually impressive reward. Alpha and Hansen are chugging right along and it will be interesting to see what happens when the aforementioned sophomore leaders face better company at nine furlongs and beyond.